With the Intel Extreme Masters Season XII in Oakland a very exciting CS: GO tournament is waiting for us in the middle of November. Organized by Intel's Esport Division, 12 teams will participate. Among them are well-known CS:GO teams like Astralis, FaZe Clan and G2 Esports. So we have a firework display of CS: GO where every player will give his best. After all, the prize money is $300,000, which makes this tournament a respectable one, as not many tournaments are able to offer higher prize money. 9 teams were invited directly and 3 could play their way into the tournament via qualification rounds. The qualification rounds took place on 3 different continents. The IEM Oakland 2017 will therefore be an exciting tournament in CS:GO. The 12 teams are divided into 2 Round Robin groups, which means that everyone plays against each other within the group. There is a lot to be gained, as the winners of each group enter the semi-finals directly and can save themselves a intense game for advancement. The second and third place finishers will be in the quarter-finals and the lower half of the group will have to say goodbye. From the quarter-finals onwards, all matches will be best-of-three and the Grand Finale will be a best-of-five. 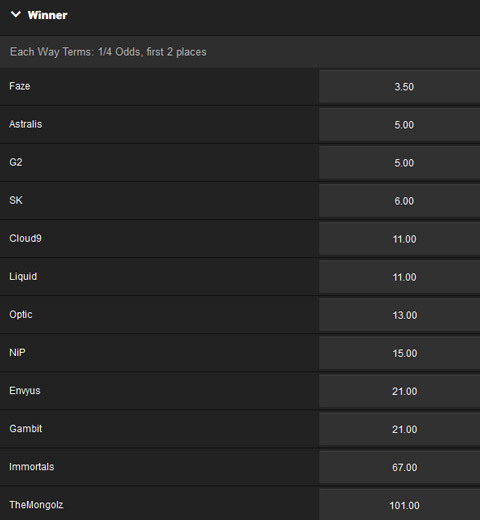 Although there is still some time to go before the tournament starts, there are already the first CS: GO bets with odds for the IEM Season XII in Oakland 2017, and you can already see a clear favourite in the Betway odds here in FaZe, closely followed by Astralis, G2 and SK. These teams seem to have been able to maintain their good form lately and are likely to be favourites for this tournament. Nevertheless, everything can happen here and so it is possible that a team with much higher odds will win the race. Please notice! CS:GO betting odds shown might have changed in the meantime. Follow the links to take a look at the current betting odds. Immortals: boltz, steel, horvy, destinyy, zqk. Ninjas in Pyjamas: f0rest, GeT_RiGhT, Xizt, draken, REZ. Team EnvyUs: Happy, SIXER, RpK, xms, ScreaM. The MongolZ: Tsogoo, ncl, Machinegun, Zilkenberg, maaRaa.